If you read my profile you will know I am following in my father's footsteps as regards to taking up photography. He, however, was a commercial and industrial photographer whereas I specialise in pet portraiture. Still, same principals apply. My mother was recently clearing out her loft that had not been touched in decades. She came across one of my fathers old cameras which she gave to me. So I thought I would share it with you. This camera is a Plaubel Makina IIIr. It dates back to the early 1950's. Dad would have probably bought it second hand. It is fitted with a 100mm f4.2 lens. I don't know if he had other lenses for it but he probably did. It was designed to take individual negatives that were inserted into plates that fitted on the back. However, you could get an attachment to take roll film. 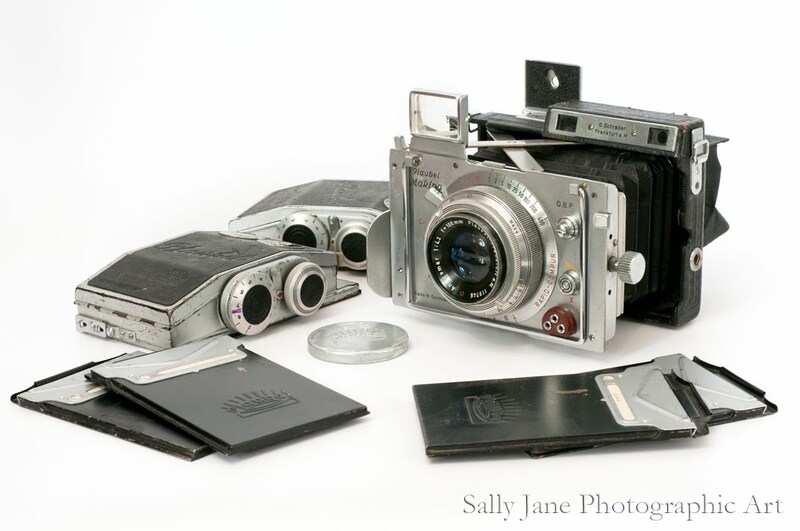 The image below shows two rolliback for roll film and 4 film plates for individual negatives. To focus the camera when it was on a tripod you fitted a piece of ground glass with a sun shade around it. You can just see the sun shade sticking out the back of the camera on these shots. The image would appear upside down on the ground glass plate. Once the image was composed and focused you removed the ground glass plate and replaced it with either the single negative plate holder or the rolliback containing the film. You could then expose it using the shutter release as normal. Not exactly something you could use for sports action. 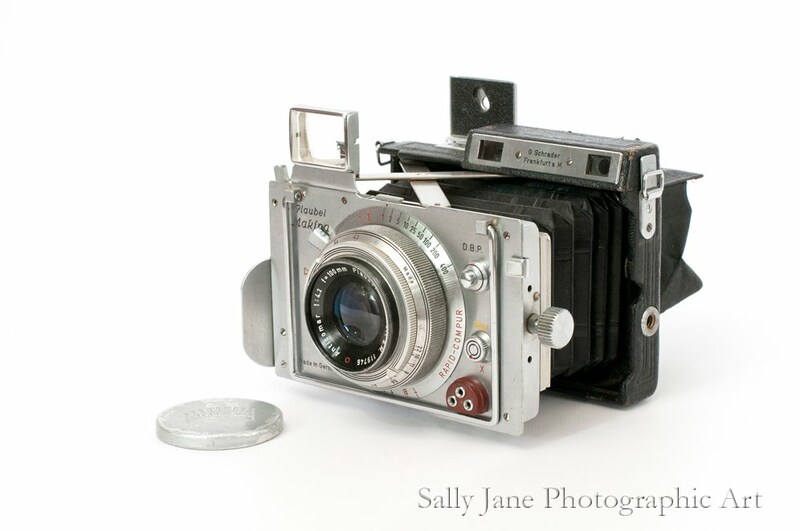 If you wanted to use it hand held, instead of using the ground glass plate you could look through the pop up view finder or use the range finder(the two rectangular ports on the top next to the view finder). Really makes me appreciate my digital SLR. I've been encourage to take the plunge and run some film through this camera so I have ordered a couple of rolls of black & white 120 film. It remains to be seen how competently I can use this camera so the results will be very interesting. What happened? Did you ever use the 120's? Did they come out well? I did, but the results were not that brilliant. There seemed to be a problem with the mechanism so I need to find someone who can service these old cameras. Have it serviced, indeed. The IIIR is the best of the line. What problem exactly does it have? It doesn't wind on properly. After releasing the shutter if I wind the film on it doesn't wind, the leaver moves but the sprocket doesn't just like it thinks it has already been wound on. Instead I have to put the back plate in again and fire it a second time. Then I can wind it on. Also, the range finder doesn't work but I believe that is a common problem. I have been recently given the details of a person who can service them down in Cornwall so I'll get in touch with him probably after Christmas now. It'll mean posting it but they pack up quite compact and seem pretty sturdy so I'm sure if I pad it well it'll be OK. The rangefinder thing, you made sure it is not a user error, such as the struts not being correctly positioned for your Anticomar? When opening the front, it first locks on the position for the WA Orthar, and you need to press the two metal buttons (one in the upper part, one in the lower part) to expand it a bit more until it reached the second stopper, for the 100mm lens. And the issue with the winding happens on both rollfilm backs? Are both 6x9 backs? Thanks for the advice. It has become a shelf queen but not because I can't be bothered with it but because unexpected health issues have got seriously in the way this year. I'll check out the range finder advice but as for the winding issue, I've only tried it with one of the backs, it never occurred to me that the back might be the cause of the problem. Yes, both are 6x9. Thank you J. I'll certainly be picking your brains when I get around to it. I've not got the camera to hand at present as it's packed away but I'll try and remember to get it out in the next few days and take a look. It does look like the kind of thing one should be able to carefully take apart and put back together if one is careful but with so many small pieces and it being a bit special to me I decided not to risk it. I was going to send it off to be repaired but then other priorities took over and it got forgotten.